DON”T just read the front of the package, or jar…or believe what they manufacturer tells you when they are trying to sell you their product! My son has been going on and on about a sauce that he loves called Peruvian Gold Grilling Sauce. It’s a local company that makes the sauce right here in Jacksonville, FL. When we were in the grocery store I decided to grab a bottle and try it. Then I read the ingredients! Sugar was the first one. In addition to the sugar was molasses, light brown sugar, corn syrup and dextrose, Some were real food (mustard, turmeric, Molasses, tomato paste). But many were chemicals or toxic ingredients; caramel coloring was listed twice, soy protein, dextrose, soy flour, “natural’ flavoring (of which they do not have to disclose what it is). I decided I would just make some. So I went to their web page and looked for info about it. That’s when I saw that the ingredient list on the bottle was vastly different that what is listed on their web page for this product. Suggestions: grilling, roasting, baking, or just saucing it. 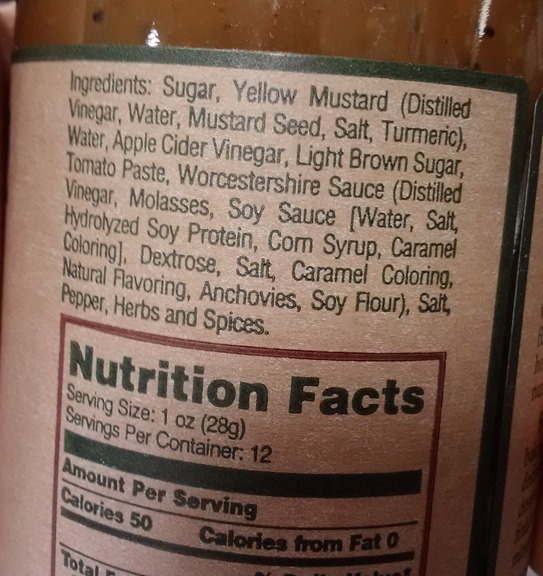 Ingredients: Sugar, Yellow Mustard, Water, Apple Cider Vinegar, Light Brown Sugar, Tomato Paste, Worcestershire, Salt, Pepper, Herbs, and Spices. Good thing I didn’t just read the web page and grab the bottle instead of reading the ingredients..the actual ingredient list…not the one on the web page.